Digging Deeper with God Fruit of the Spirit: Self-Control--Yeah, That! Inside: Have you spoken rash words in haste that you have regretted? Do you feel trapped in passions and addictions? Find hope in your pursuit of self-control–the fruit of the Spirit self-control. Can I just admit to you that writing these last couple of devotions on the fruit of the Spirit has been painfully humbling and, honestly, personally embarrassing? If the Holy Spirit has ever convicted someone, it is yours, truly. Goodness, this is hard. It is challenging to write lofty things about these virtues if you know you’ve not let the Holy Spirit fully take over that area of your life. I’ve yelled at my dog, lost my temper with the kiddos, and spewed forth anger, maybe more inside than out, these last couple of weeks. In my defense, middle school girls are hard. I’ve been angry at school shootings and bullies and at the general fact that life isn’t fair. These days have also seen moments of grace and gentleness: sweet bedtime conversations with said middle school girls, listening ears for problems that cannot be solved, and side-splitting laughter as we run our winter exercise circuit inside the house. I’ve lost disastrously at laser tag, Battleship, and Life on the Farm–a clever board game, like an abbreviated Monopoly with Midwest roots (see below for a link). But those rose-colored stories thinly veil the fact that I’ve been sliced open, laid bare, and found excruciatingly lacking in Holy Spirit fruit. It is almost as if Jesus healed the ear on reflex. This is life on automatic when you’re One with the Holy Spirit–healing a person who has come to take you away. We learn from the account in John that it was Peter who cut off the servant’s ear, and the servant’s name was Malchus. Jesus’ response to Peter’s lack of self-control gives us all hope! Jesus did not condemn his rash disciple, the one who always spoke too soon and acted hastily. Hand raised here. Isn’t it good to know that when we don’t have it all together, Jesus has us covered? But Jesus didn’t belittle or dismiss Peter; rather, he redirected him. Dear friends, let us rest in that grace today. When anger rises and words slip, and you come repenting to your Savior, know that he forgives and points you in a constructive direction. Peter? His impulsiveness became resolute confidence, when by the power of the Spirit he spoke boldly on Pentecost, proclaiming Christ’s resurrection to a roomful of strangers. The Holy Spirit can work the same change in us. He can move us from hastiness to thoughtfulness, from lack of self-control to discipline. Do you have questions about whether you are filled with the Holy Spirit? In a different attempt at self-control, I didn’t look this up–choosing family time over computer time–but somewhere in my studies of the fruit of the Spirit, I learned that we know we have the Holy Spirit in us if we have the inclination, the desire, to walk with the Spirit and to let his fruit flow through us. Come, Holy Spirit. Fill my heart until I overflow with your fruit. I want to bear fruit that lasts for your glory. Amen! What part of your life do you need to open to the Holy Spirit’s work of self-control? Cherish this time with the Lord as you dig deeper into the fruit of the Spirit self-control. 1. Reread Luke 22:47-53 or John 18:1-11 and highlight or list all of Jesus’ actions. What do you learn from his responses during this very tense situation? 2. 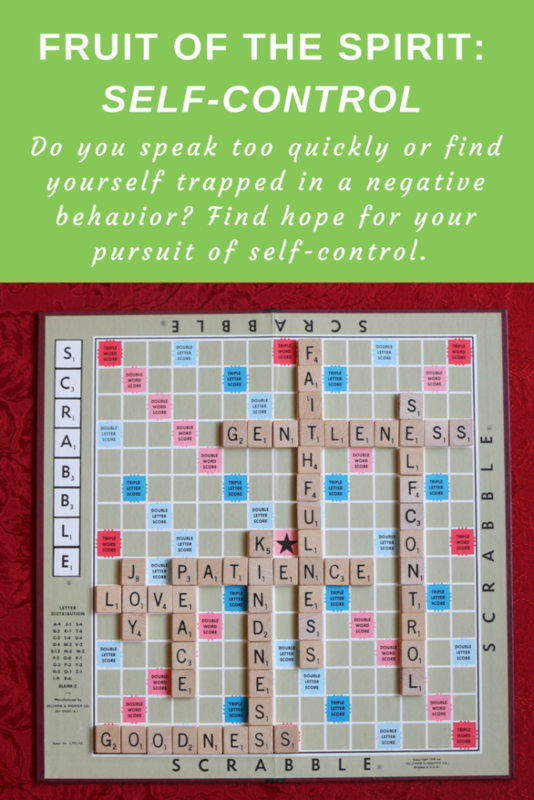 Although my struggle with self-control is over my temper and my tongue, the self-control most likely spoken of in Galatians 5:23 involves moderation or temperance of such passions as eating, drinking, and sexual lusts or desires. Are any of these a struggle for you? God does not shrink back from such challenges! He knows your every thought and desire: Let him into the struggle to break free from the hold of these cravings. Pray or journal about that now. 3. 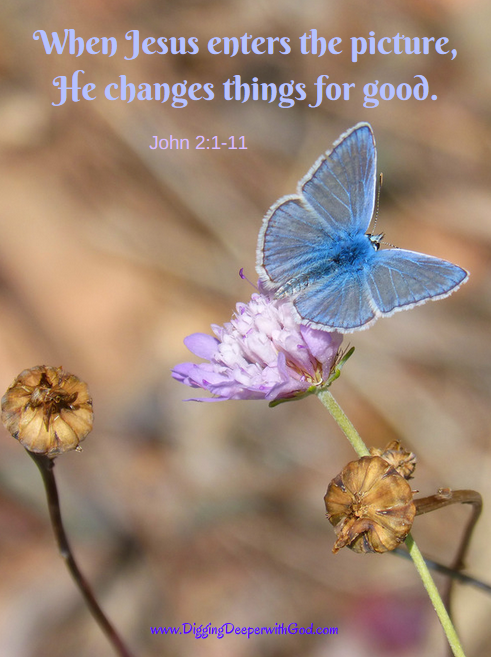 Thank heaven for forgiveness and renewal! If you trust Jesus as your Savior, the Holy Spirit is already working inside of you. You live as a forgiven child of God! Take some deep breaths and rest in that assurance today. Songs to rest in this week. Oh, Lord, forgive us for not living out the fruit of the Spirit self-control. Thank you for renewing us and giving us new life. Just for fun! This is the board game I mentioned in this article. Overcome the common hurdles of farming to increase your herd of cows. Early on in writing this series, I heard David Jeremiah interviewed about his book based on the fruit of the Spirit. I did not use it as a source, but his interview was very good and biblically based, despite the bent of the book’s cover. Just about every Sunday morning, I catch part of Charles Stanley’s preaching. Yes, he is old, but he is very wise, and I figure I should soak in as much of his teaching as possible before he passes on to heaven. I am fascinated that someone researched the effects kindness can have on our family, friends, and community. Check out The Kindness Challenge! Fruit of the Spirit SELF-CONTROL! 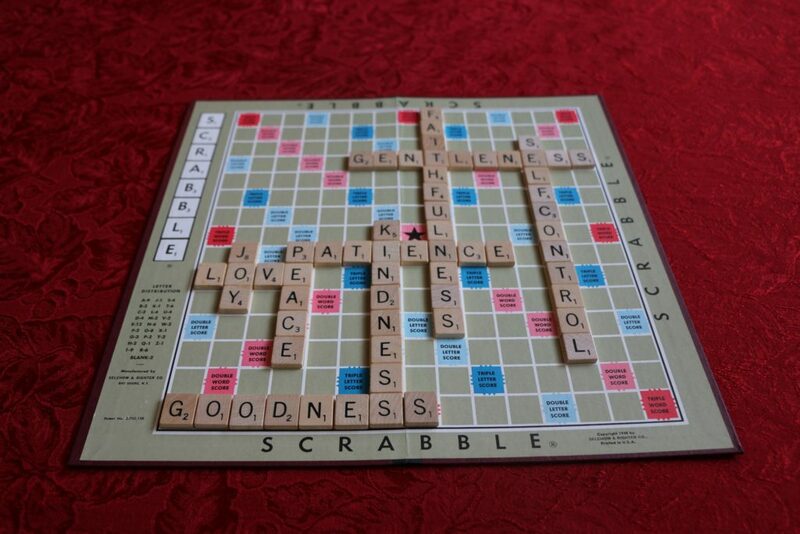 *People have been asking: Yes, I had to borrow a few extra letters to spell all of the fruit of the Spirit at once on the Scrabble board! The real trick was finding an arrangement in which all of the words connected. Notice that it stretches to each side, top, and bottom of the board.